I just find it so hilarious when kids have an all-time favorite cartoon hero yet can’t get near it when they see it in person. That’s exactly what happened when Toby saw Catboy, the leader of the PJ Masks Trio. 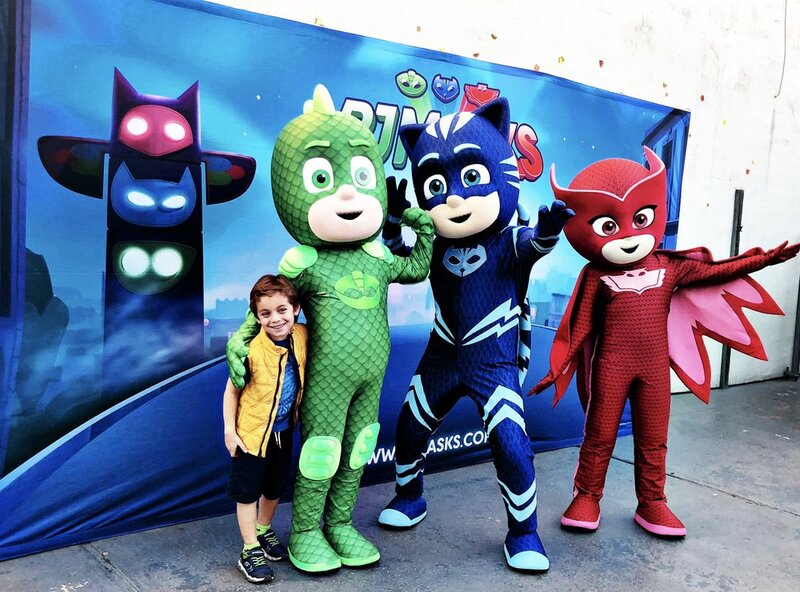 The PJ Masks is a show about heroism and empowerment and its’ superheroes are children! 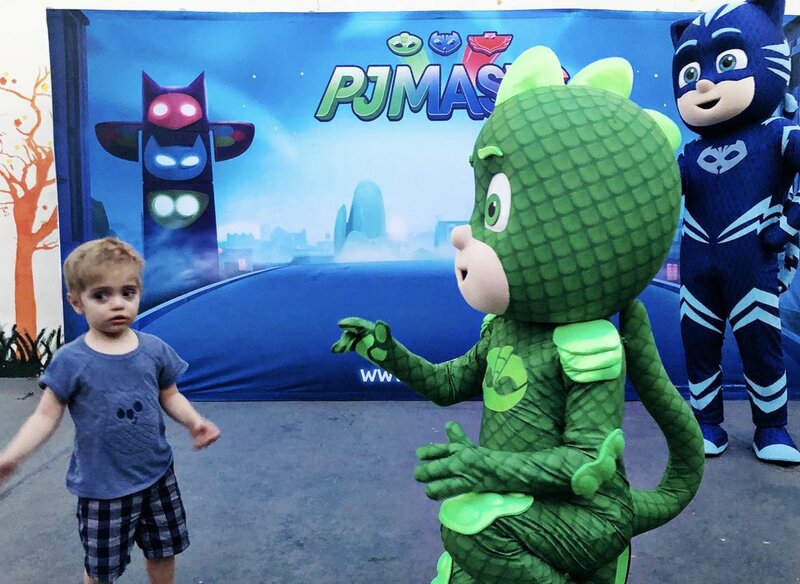 It was held at The Coop Indoor playground in Studio City with an afternoon of action-packed and imagination-inspiring adventures, a hero dance party and even a meet-n-greet with the PJ Masks themselves! 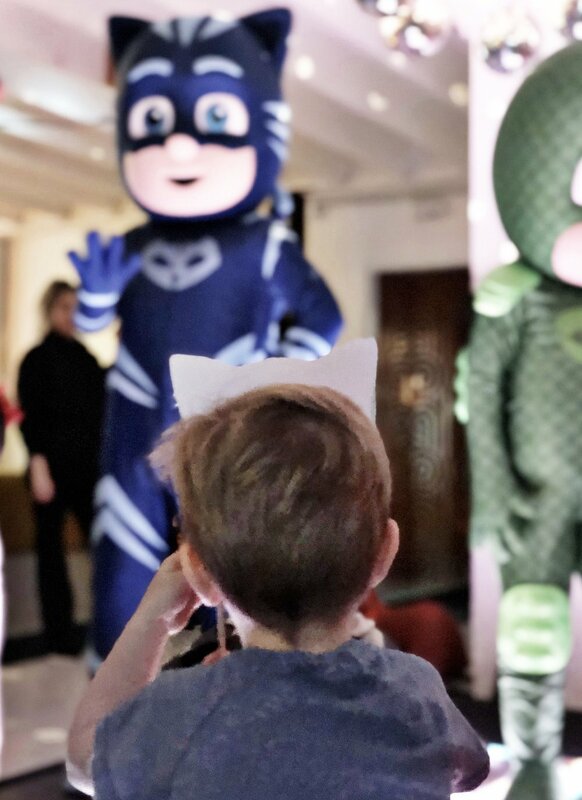 role-playing with masks, toys and an adorable dance party where the little ones got to hug, dance with and enjoy fun tunes with the PJ Masks. Toby insisted on showing Catboy that he too had a Catboy mask! Connor / Catboy is a blue-eyed boy with brown hair. When he transforms he wears a blue cat costume with cat ears and a thin tail. He has super-hearing using Cat Ears, can leap high and far using Super Cat Jump, and sprints fast using Super Cat Speed. Amaya / Owlette is an auburn-eyed girl with brown hair who wears red glasses. When she transforms, she wears a red costume with wings. She has owl eyes which lets her see things that are far away up close, and she also has super owl wing wind. Greg / Gekko is a green-eyed, blonde haired boy. When he transforms he wears a green costume with a thick reptilian tail and fins on top of his head. His powers are, Super Gekko Camouflage to go invisible or blend into his surroundings, Super Gekko Muscles to lift heavy things, Super Lizard Grip to climb walls or anchor himself to stop vehicles, and Super Lizard Water Run to walk on water. the kids had already enjoyed their fill of PJ Masks cupcakes and received some awesome PJ Masks gift buckets! 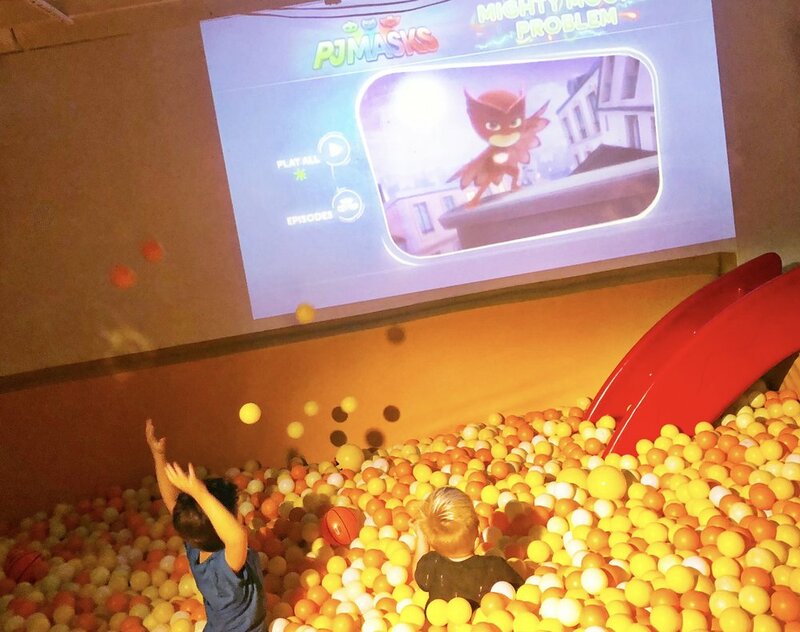 We love PJ Masks and we’re very grateful to have been invited to this awesome play date! Thanks PJ Masks and thanks for reading, friends!